British opposition Labour Party leader Jeremy Corbyn urged Europe’s Socialists on Friday to challenge the political establishment and team up with like-minded leftists to check the rise of “fake” right-wing populists. “The stakes could not be higher. 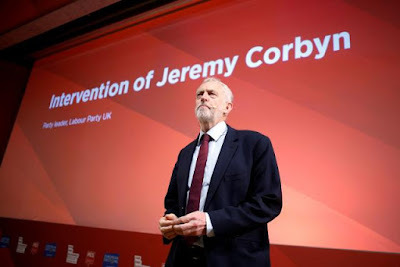 If we cannot rise to the task, then we will smooth the path to power of the fake populists,” Corbyn said in a speech to the annual congress of the Party of European Socialists in Lisbon. “The far right feeds on fears fueled by falling living standards, damaged communities, insecure work and underfunded public services. Far-right anti-immigration forces have been on the rise in Europe in recent years, coming to power in Italy, Austria, Hungary and Poland, gaining clout in Germany and France, and scoring their first success in Spain on Sunday. “If the European political establishment carries on with business as usual, the fake populists of the far right will fill the vacuum,” Corbyn said. He called on left-leaning leaders to work together as they do in Portugal where the minority Socialist government is backed in parliament by the two far left parties. Speaking just ahead of a Dec. 11 British parliament vote on Prime Minister Theresa May’s Brexit plan, Corbyn reiterated that Labour felt the deal should be rejected while a better one, ideally for a long-term customs union with the EU, remained possible.